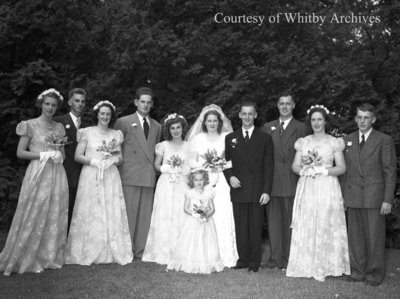 A black and white large format negative of the Brown-Eastwood wedding party on July 28, 1948 in Greenwood, Ontario. We believe the bride to be Mildred Brown and the groom to be Glynn Eastwood. Brown-Eastwood Wedding, July 28, 1948, Marjorie Ruddy. Whitby Archives A2013_040_356.